These days, there’s a high degree of sophistication in the manufacturing of furniture using wood veneers and synthetic materials. So it causes one to wonder if solid wood furniture might not be a thing of the past. Indeed, an entire industry has developed around the manufacturing and marketing of inexpensive, easy-to-assemble furniture. So it’s high time to explore the advantages of solid wood furniture. Based on its beauty, strength and durability, solid wood furniture remains unrivaled. 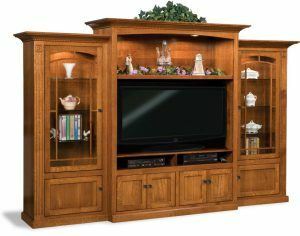 The Manhattan Mission 3 Piece Wall Unit illustrates the beauty of solid hardwood. Take a passing glance at synthetic hardwood furniture. You might think it’s indistinguishable from solid hardwood furniture. And this is due in part to the fancy way manufacturers design and build furniture today. For example, many builders use wood veneers or plastics that closely replicate real wood. Also, they often use veneers for the parts of furniture that are most obvious. And they use bargain substitutes everywhere else. In addition, they apply thick coats of varnish to materials like particle board. So the furniture looks like real hardwood. However, inspect this type of furniture closely. And you can tell which is the real McCoy. For example, check out where the veneers end. Such as at the end of a raised panel. And you can see an abrupt end of the fake woodgrain. Also check out the joints, undersides of shelves and the interiors of drawers. And they give tell-tale evidence of inferior substitutes. But with solid hardwood furniture, the luster of the solid hardwood shines through on the highly visible areas as well as the undersides, backs and drawer interiors. Solid hardwood has been the standard material used in furniture over thousands of years. And this is due in great measure to its strength and durability. Plus, this is why Amish builders depend on solid hardwood. And numerous Amish cabinetmaking shops in Indiana and Ohio sell their excellent products through Brandenberry Amish Furniture. The Amish craftsmen use hardwoods like cherry, maple, oak and hickory. Also, they use solid hardwood in places where others place cheap substitutes. Like for shelves, and in the back or bottom of furniture. Strength and style meet in the Brooklyn Gentlemen’s Chest. This means the solid hardwood furniture you order from Brandenberry should, with proper care, last for generations to come. In fact, many pieces become family heirlooms. 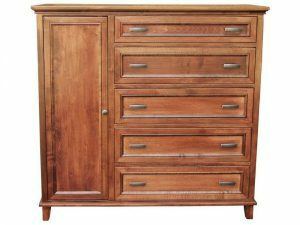 The Brooklyn Gentlemen’s Chest, pictured here, boasts dynamic storage space and sturdy wood craftsmanship. This solid wood furniture piece not only provides the space and style for today’s needs, but the timeless beauty to become a treasured heirloom. To see more solid wood furniture pieces, visit Brandenberry Amish Furniture. Or, visit our ‘brick and mortar’ store in Shipshewana, Indiana. And check out the huge selection of Amish furniture.